Just two weeks to go until Arab Health, at 28 – 31 January 2019 in Dubai. EWAC Medical will be present in Hall 1 Stand SA.B31. We would like to invite distributors, hospital and clinic managers, general practitioners and professionals in all specialities of the health sector who influence and make purchasing decisions to our stand. How can we implement hydrotherapy in our existing program? How long will it take to build or assemble a movable swimming pool floor? What are the factors to consider when building a pool? Is hydrotherapy is cost-effective for our hospital, rehabilitation centre or clinic? At Arab Health we want to introduce you to the hydrotherapy training course EWAC Medical offers in collaboration with doctors around the world. This training course is suitable for therapists, distributors or hospital managers around the world, who are looking to learn techniques to support your patients healing and rehabilitation. 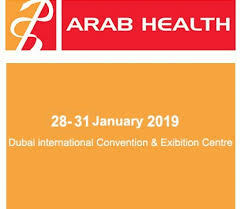 Arab Health Exhibition and Congress is the largest medical exhibition and conferences in the Middle East. As the largest collection of healthcare product manufacturers and service providers under one roof, Arab Health is your one-stop shop for all your healthcare sourcing and procurement needs. With thousands of products to explore, coming in from more than 68 countries, make sure you don’t miss this essential business event.